Craig is a Ric Man. 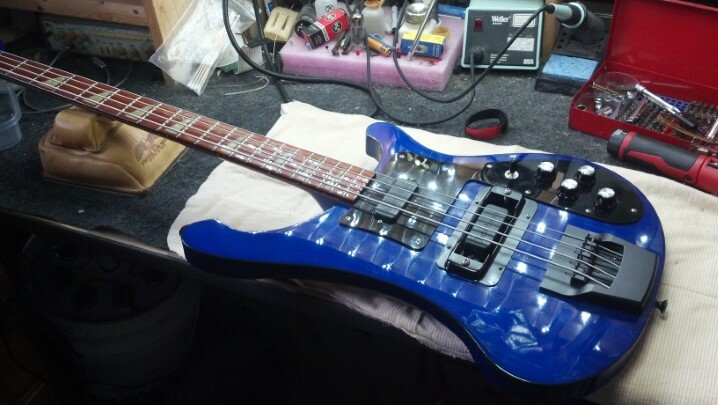 This beautiful blue bass in only one of his many Rics. 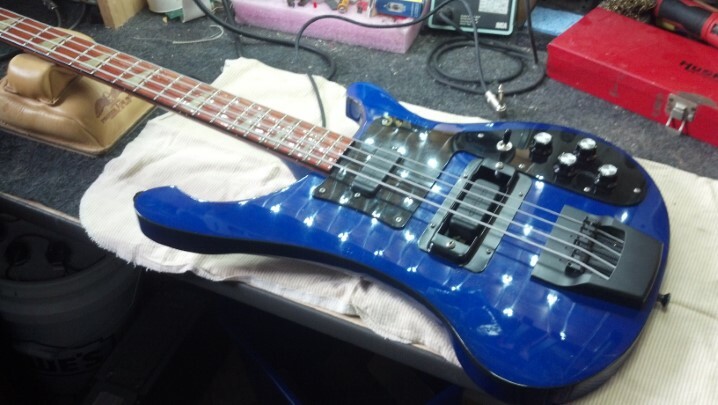 This one has problems with getting both pickups to work. Could the Unbrokenstring Crew get all this sorted out? This instrument plays beautifully and has no real discernable setup issues. 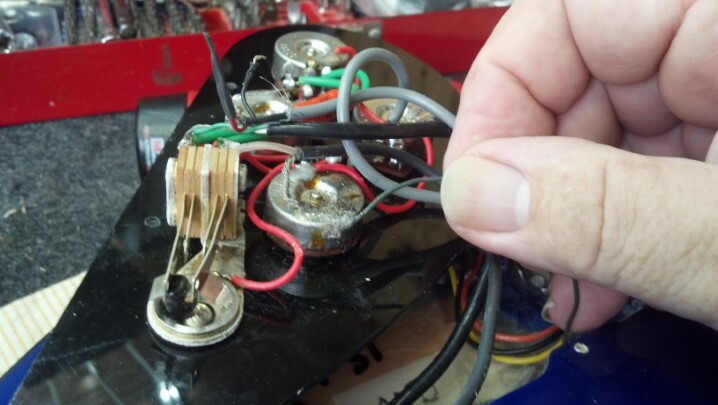 However, the wiring seems to be amiss! 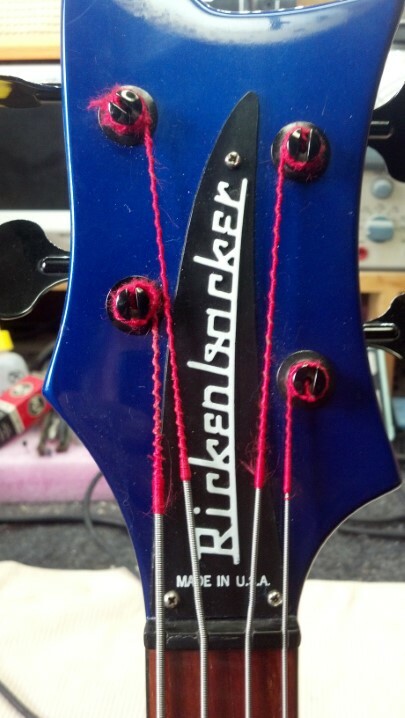 More than a few of you will have heart palpitations seeing this head stock. 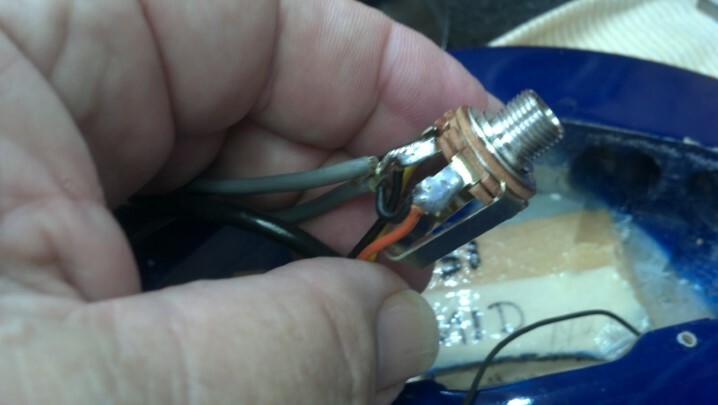 Two output jacks allow a mono mix of both pickups as is usually found with most multi-pickup instruments, plus a special “Ric-O-Sound” jack that presents the signals from two pickups as two separated signals, accessible with a stereo cable (TRS.) This gives the player the ability to run two preamps, two effect loops, two separate amps, etc. 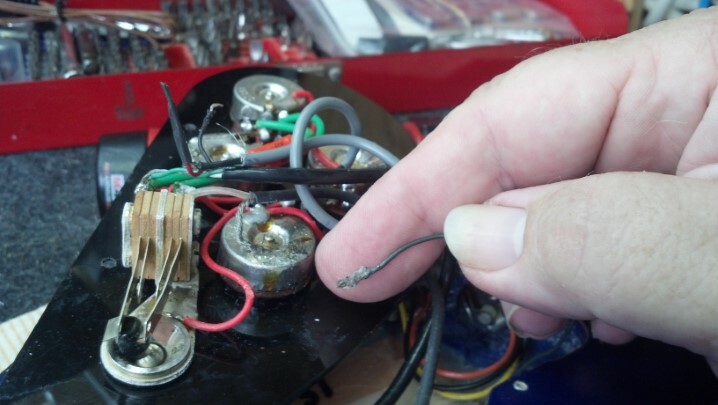 Immediately after looking under the pick guard, we find a loose wire. 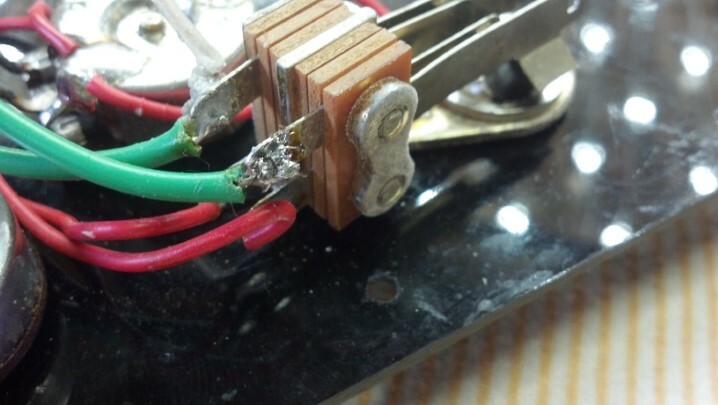 Poor soldering here. 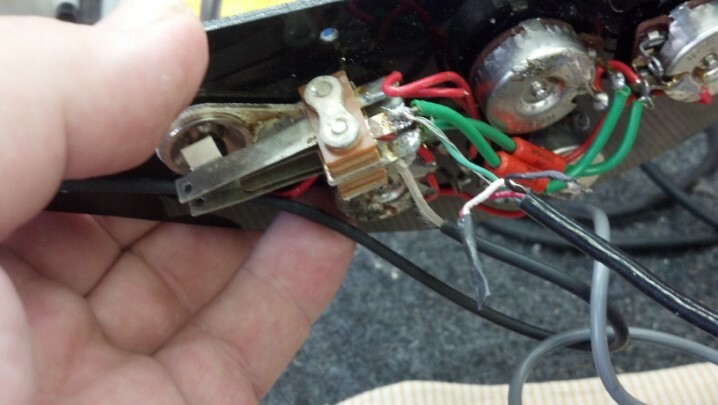 Here is another broken wire, another ground wire. 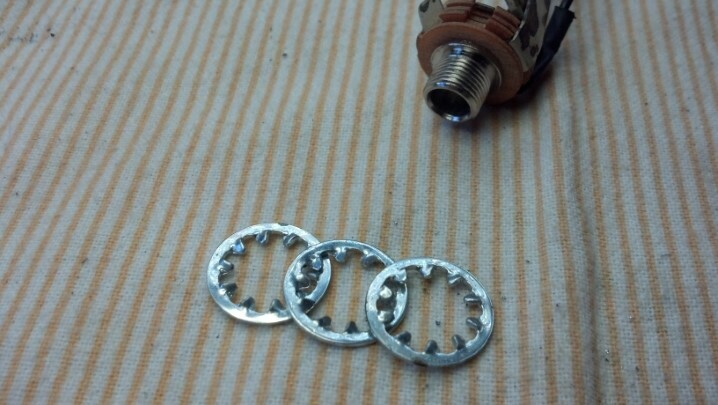 We have a stack of three inside-tooth lock-washers under each output connector. 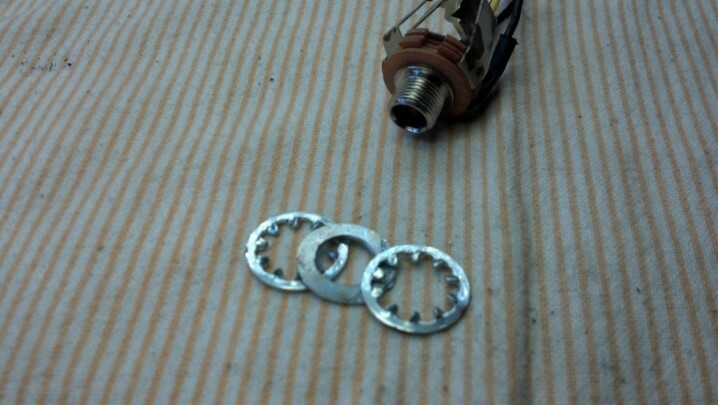 Not much spring action available from the teeth of these locking washers, so they don’t really lock. 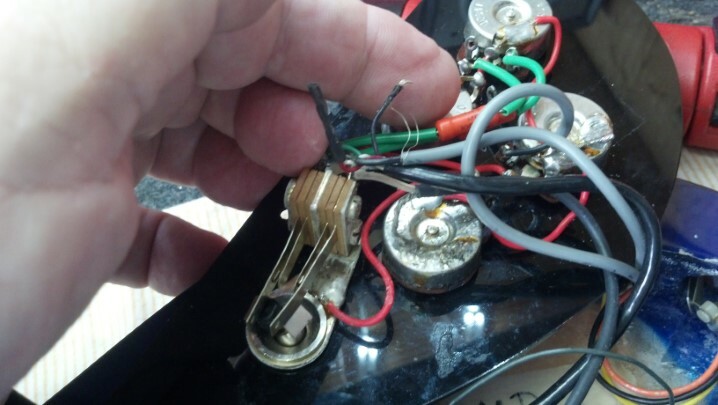 A magnet is the quickest way to clear all this extra hardware out of the control route. This is the stereo jack handling the “Ric-O-Sound” duties. 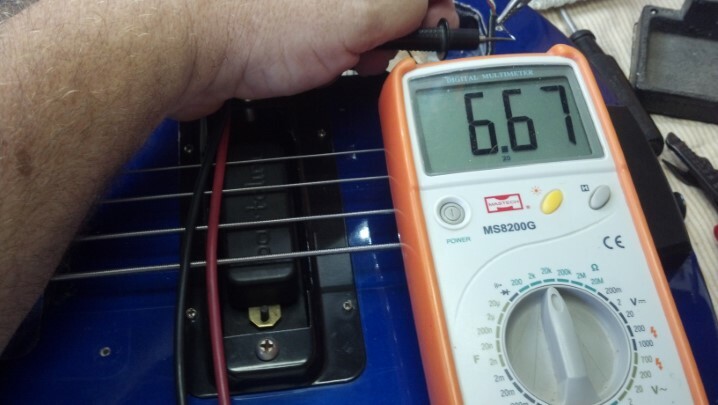 The mono jack handles the single-ended output from this instrument. 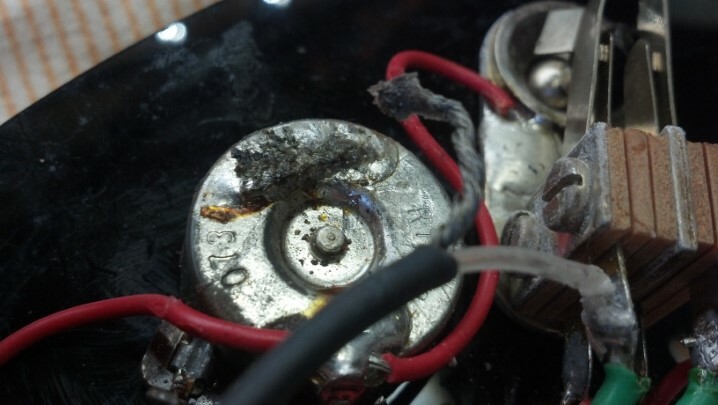 Soldering workmanship on the switch needs some attention as well. 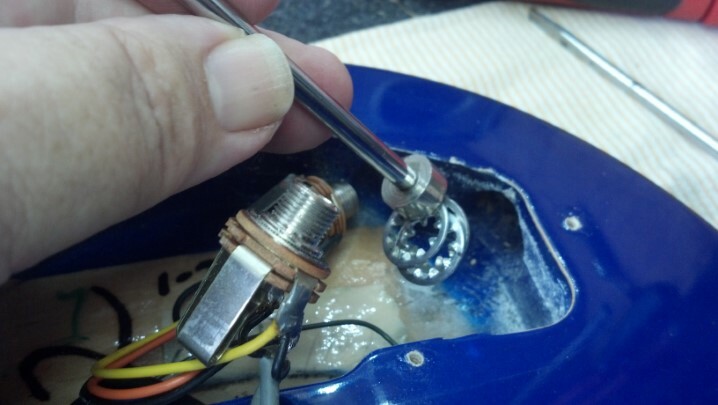 Disconnecting each pickup allows us to do some cleanup in the wiring cavity. 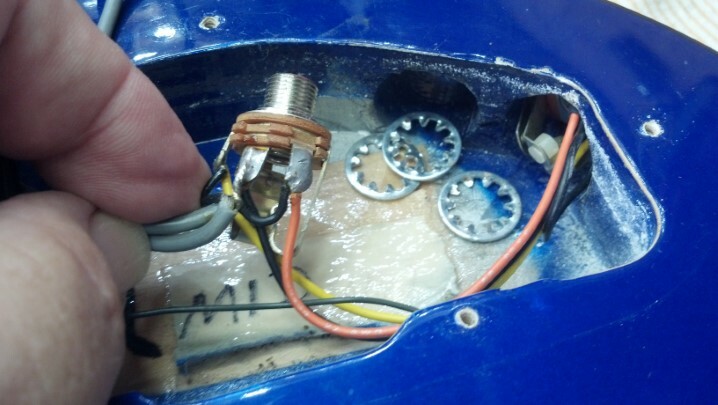 The neck pickup is ohmed-out. 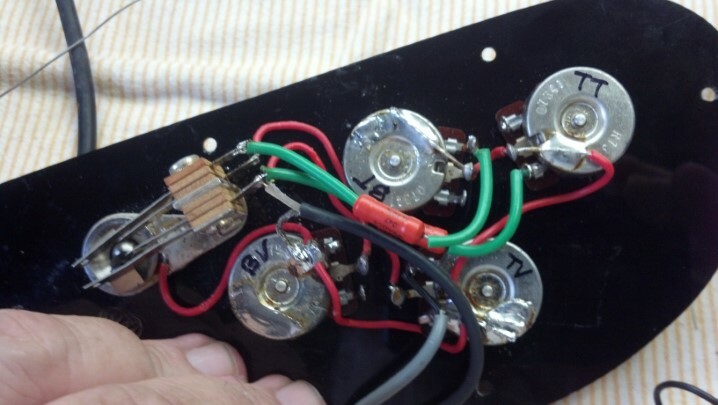 The neck pickup is sometimes called the ‘treble’ pickup. 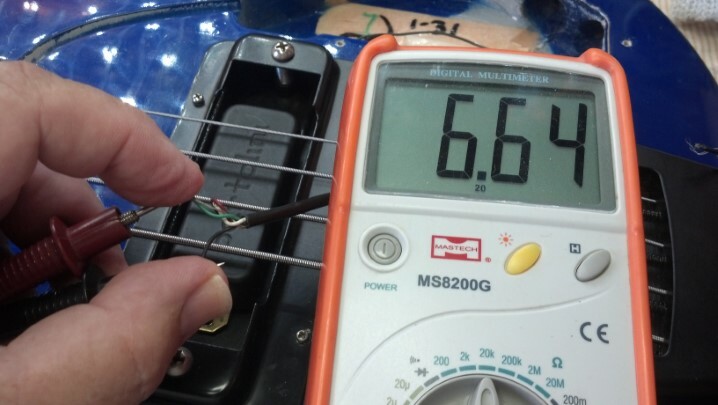 And we do the same with the bridge pickup. 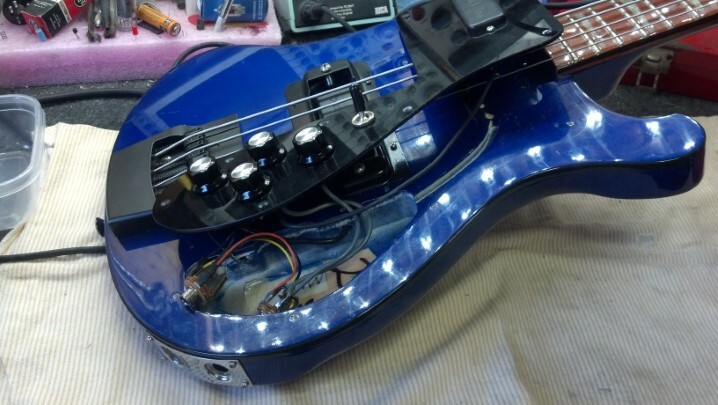 This pickup is also called the ‘bass’ pickup, which seems redundant. 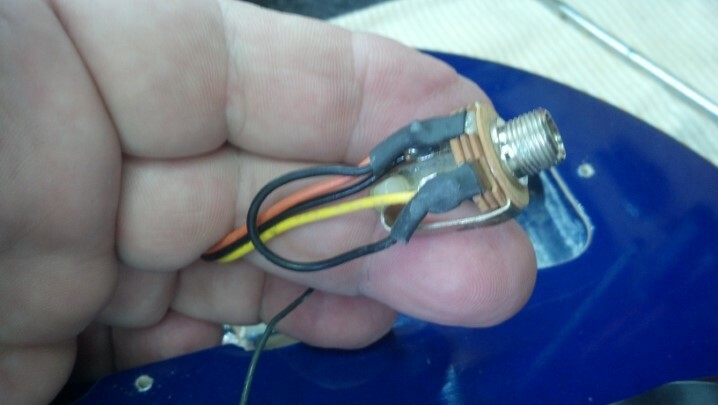 Perhaps this soldering was done with plumber’s solder. It is awfully dull. Another look at the switch. Not much to brag about here. 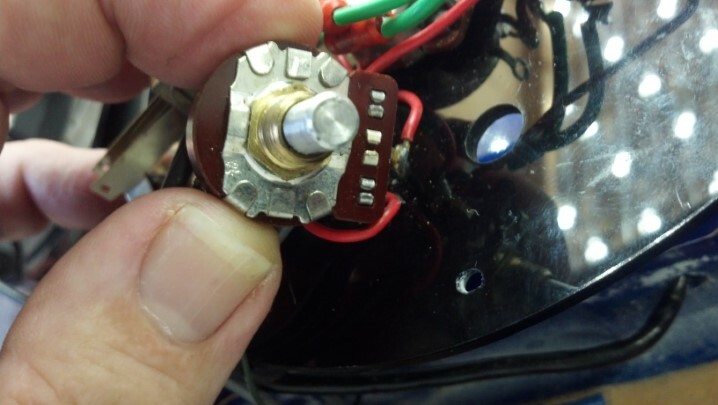 The ground connection to the control is redone. 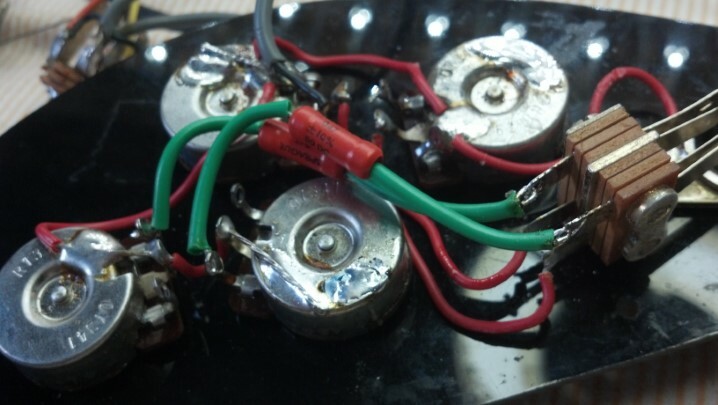 Smooth and shiny is the name of the game when soldering. 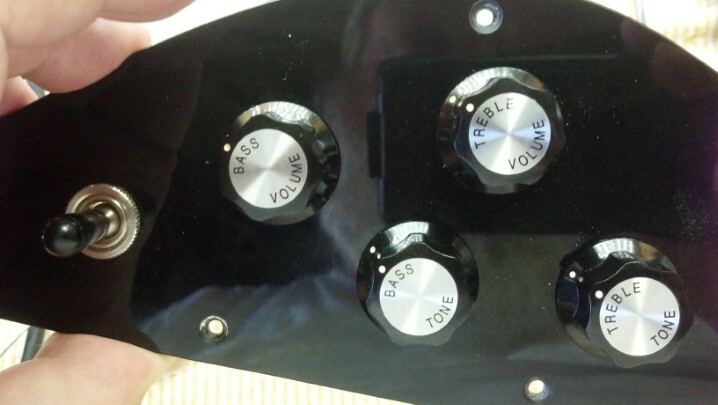 Now that the controls are identified, we can install the knobs in the Correct location. Yes, they were in the wrong place. When stacked, the teeth have nothing to push against. The teeth are literally hanging out in space. 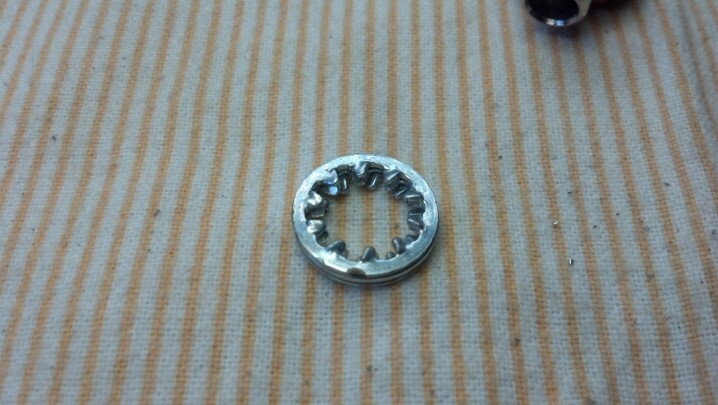 A flat washer in the middle will provide some ‘resistance’ for all the teeth to press against, thus restoring the action of the lock washers to that of being, er, well, lock washers. The jacks are Imperial measurement and this washer must have been metric. 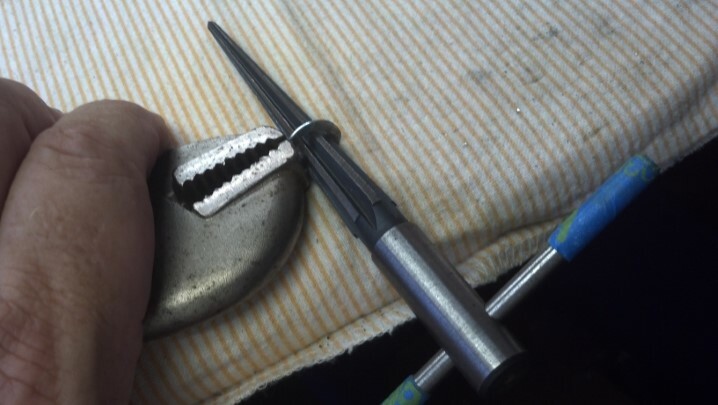 A little gun-smithing is in order. 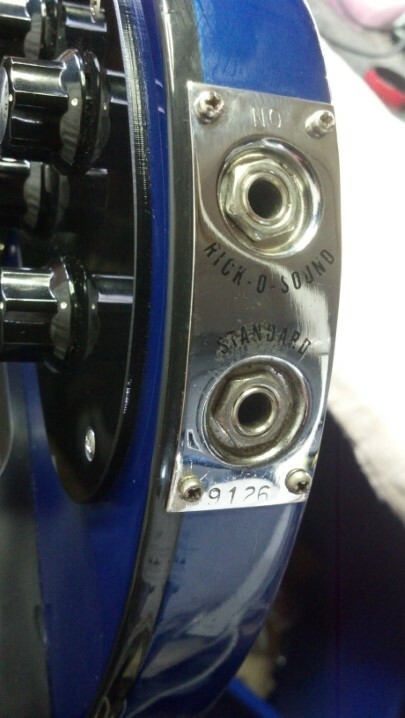 The output jacks are wired and tightened into their correct locations. Testing shows no output. It has something to do with this volume pot. What the hey?? This is the hey. 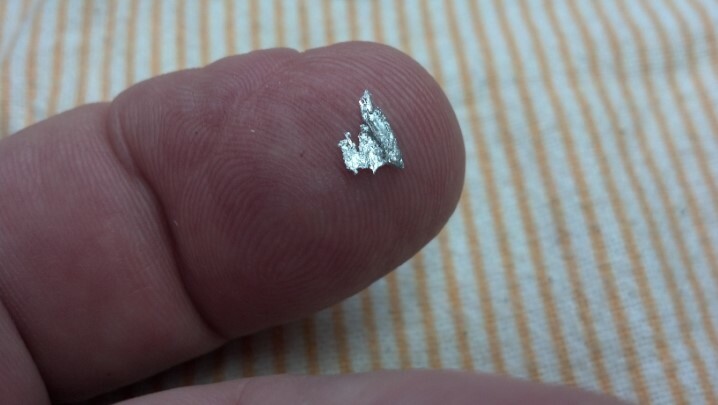 This bit of conductive solder debris was underneath the volume pot, shorting the ‘stapled’ contacts seen in the previous picture to each other, and thus, shorting the output to ground. Together again, and it’s playing in stereo!